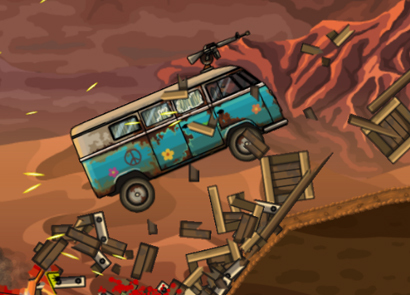 Earn to Die 4 is the latest installment of the series. 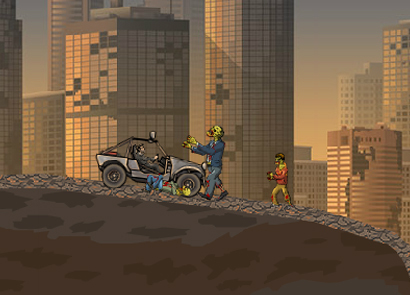 Here the game quickly picks off from where it left off and sees the main character escaping the zombies and reaching the military base. He has boarded a plane and he has been airlifted to safety. Or so he thinks. 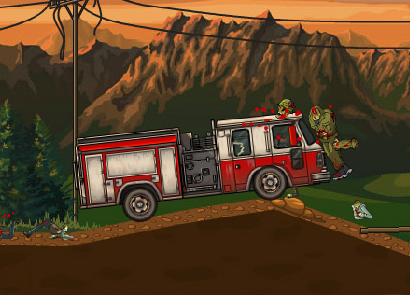 The plane has been overrun with zombies and because of this it crashes back to the ground. The main character has no other choice but to again make a run for the nearest town which is safe from the invading hordes of the undead. 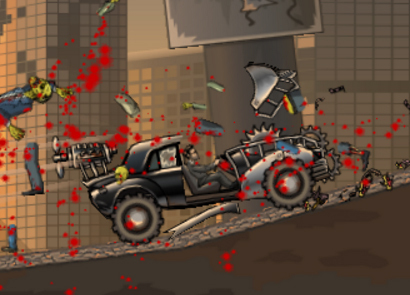 Different from the other zombie-run em over games, this game now utilizes 3 cars. The 4 door sedan, the station wagon, and returning from 2012 version, the muscle car. There are no powerful trucks as before. 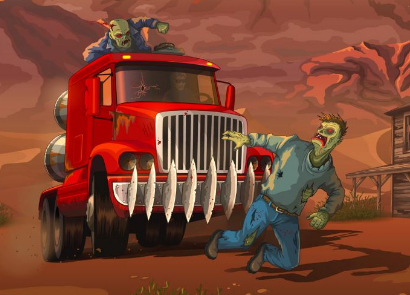 But that doesn't mean that the game is lacking in numerous zombies to overrun and massacre. 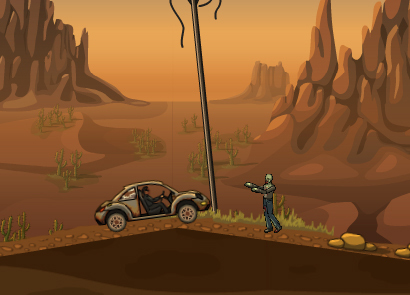 As in previous games, you'll have a lot of zombies to kill and obstacles to smash through. 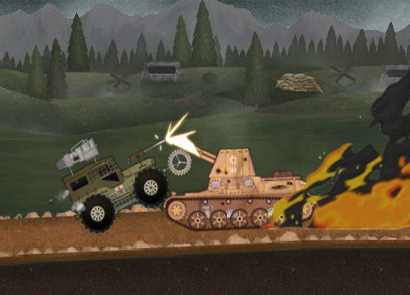 If you know how to play the first on, you can play all games easily, since controls remain the same. Use the directional keys to steer your vehicle. The up key moves the car forward. The down key moves the car back or slows it down. The left key tilts the car upwards, while the down key tilts it downwards. Use these keys to stabilize the car. Keep it balanced and steady all throughout the game, as if it tumbles over, you'll have to repeat the level. This does not happen frequently however, and more often than not, you'll be repeating levels because you've run out of fuel. When you have the turbo boost upgrade use it with the x key. 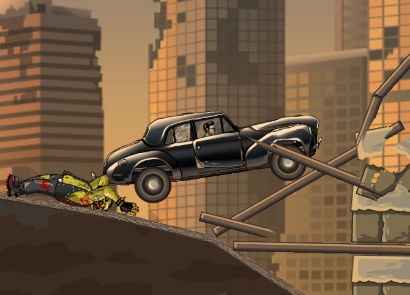 The whole game starts with your first car, the 4 door sedan (just like in Earn To Die 5). It's an average, compact and generally reliable car to start the game with. Reliable to a point at least. 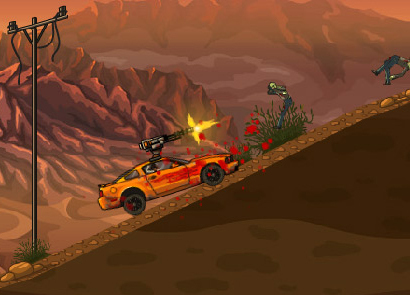 As in all versions, using the first car will only be able to take you to a point in the game. It will not be able to finish the entire game for you. You'll have to upgrade the car in various parts to be able to make the most of it. 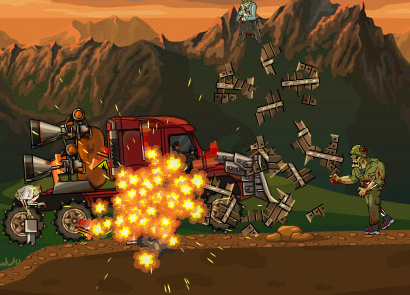 After you have achieved this, you would have progressed to a fairly far distance in the levels. 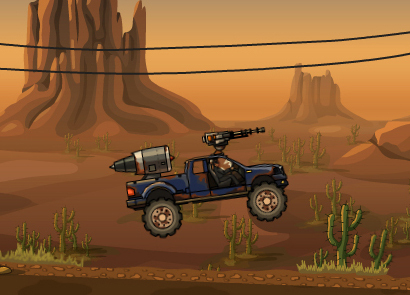 Here you would again come to a point in the game where you would be stuck, unless you now buy a better vehicle. Repeat the process of upgrading the core parts of your new vehicle and let it take you as far as it can. Then buy the best vehicle in the game ( in this case, the returning muscle car) and then upgrade everything again. Repeat this process and you will finish the game in no time at all. But how do you upgrade the cars? With cash. Each attempt, each time you travel to a point you earn cash. Don't worry if you don't earn a lot of cash at first or don't travel too far because of your car's limitations. The important thing is you're moving and earning money. Just keep repeating this process till you earn a significant amount of money. Then before you know it you can purchase the upgrades. Because of the rather violent nature of the game, which is running over zombies, it's probably not a good idea to have kids play this. It is however presented in cartoon-like fashion which makes it less gory, but the subject matter is still mature. Teens however would be a very ideal audience for the game. 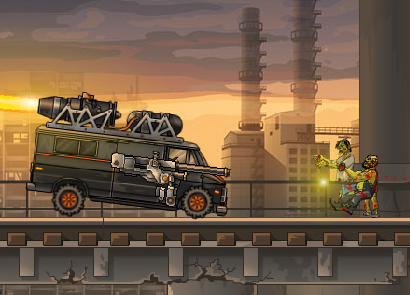 If you're looking for more friendly upgrade-style game, you can try Shopping Cart Hero .